Congratulations on finding the Salbree's, IP compatible Steamer Basket. The advantages of using our egg cooking rack are numerous. ►Silicone-Free Legs- Why do most steamer baskets not have silicone on their legs? It's because they harbor bacteria and act as a vehicle that transfers that bacteria from dish, to dish, to dish, every time you use your pressure cooker; unsafe! ►Has side walls- and our PATENTED PENDING DESIGN is designed to fit specific to the InstaPot model that you have. ►Convenient and secure handle grips- our silicone-wrapped handles can help you get a good grip on your steamer rack when removing your eggs, veggies, meat and other foods from your pressure cooker. Always be careful because the handle can still be hot. ►Quality Material- we spared no expense when building our basket because we used high-quality, stainless steel 304, which translates to many, many years of use. ►Award-Winning Customer Service- if you have a problem, please contact us, we'll do whatever we can to make it right with you. Before you buy any other steamer basket, we recommend in giving ours a try. You will not regret it. Salbree's motto is "Traditional Quality. Modern Design." INSTANT-POT COMPATIBLE - PATENT PENDING - designed to fit IP-DUO60 6 Qt 7-in-1 Multi-Use Programmable Pressure Cooker, LUX60 V3 6 Qt 6-in-1, Instant Pot Ultra 6 Qt 10-in-1 Multi-Use Programmable Pressure Cooker, but will fit many other pots and pressure cookers, including the Power Pressure Cooker XL models. Also fits the Aroma 20 cup Rice Cooker & Ninja Foodi Accessories. 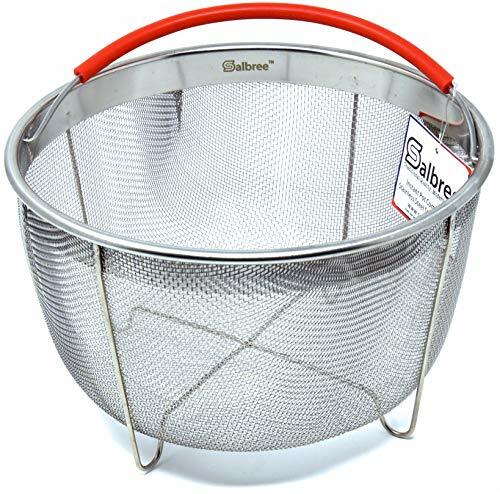 STAINLESS STEEL CONSTRUCTION & SOLID REINFORCEMENT ON FOUR SIDES AND TOP RIM - - long lasting stainless steel 304 material is dishwasher safe, solid construction adds strength and stability to the strainer basket and handle has been tested to lift up to 20 pounds, much more than needed. CONVENIENT SINGLE-HANDLE DESIGN- Sometimes you only have one free hand, while cooking your eggs, meats or vegetables, our basket will allow you to lift the basket from the inner pot with one hand. Also features premium, red silicon-wrapped handle - for you comfort and convenience and fits neatly inside of basket, out the way for food. GUARANTEED FOR LIFE - this product is guaranteed not to rust or fall apart. If you have any issues with your product, contact us and we will take care of you! If you have any questions about this product by Salbree, contact us by completing and submitting the form below. If you are looking for a specif part number, please include it with your message.